The average cost of a wedding in the UK recently hit an all-time high of £27,161, making it one of the priciest events of your life. So here’s what you need to know before popping the question. On average, couples spend £2,084 on an engagement ring alone which could be around a month’s salary for many. As romantic as a sparkling diamond ring can be, putting your finances in trouble isn’t quite as charming. Of course, many brides-to-be appreciate a bit of bling on their finger but you don’t have to spend quite so much to get beautiful jewellery. Instead, opt for a ring you both like and that you can comfortably afford. There are also lots of different types of rings that work out cheaper than classic shapes but still look stunning - shop around and see what suits you best. Engagement parties and photo shoots have been rapidly growing in popularity here in the UK. These events can be a lovely way to celebrate your new engagement, but they can also rack up the bills. Luckily, there are ways to lessen costs to suit your budget. Many engagement photographers will offer a discounted rate if you also hire them for your wedding. As for an engagement party, why not do something informal with your loved ones instead of opting for a big event? This is a nice way to add a personal touch, get your friends and family involved, and save a bit of cash for the wedding too! We all know that weddings can be pricey, with most couples splurging an average of £4,354 on their venue alone. For your big day, it makes sense to put aside some extra cash for the things that are really important to you - like the perfect location or that one dress. But with 51% of couples funding their own weddings with minimal help from family, it’s more important than ever to pay attention to your finances when you’re thinking about a wedding. There are lots of ways to cut costs when planning your wedding without sacrificing quality or sentiment. Asking guests for cash instead of gifts can go a long way towards covering costs. Or try opting for an alternative venue, which can work out cheaper than traditional halls or stately homes, whilst also adding a unique touch to your big day. We’ve put together some more handy tips for throwing a beautiful budget wedding which you can check out here. Debt is one of the most common reasons for divorce, and maybe it doesn’t come as a surprise as a whopping 49% of us are not open about money with our partners. Talking about money can be awkward for many but if you’re about to spend the rest of your life with someone, it’s about time you asked those vital questions. Big differences in debt and other finances can put a strain on relationships if you’re not honest about it or tackling it as a team. Have a chat with your partner about your respective money situations and the best way for the two of you to deal with your finances. Paying off debt can seem daunting but with a good plan and support from your spouse, it’s a lot more doable than you might think. 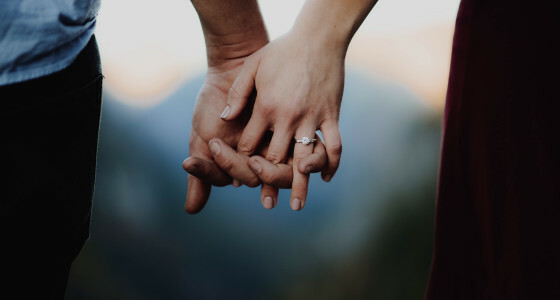 Money certainly isn’t everything when it comes to getting engaged or married, but it’s an important part of every couple’s life. Be realistic and honest about your respective financial situations and work together to ensure the happiest time of your life stays that way. Engaged or thinking of taking the plunge? How do you and your partner manage your finances? Let us know in the comments below.